Scarlets and Wales centre Jonathan Davies took some time out from his busy schedule ahead of the big Derby clash between the Scarlets and the Ospreys to drop by into Rugby Nation HQ and meet the team. 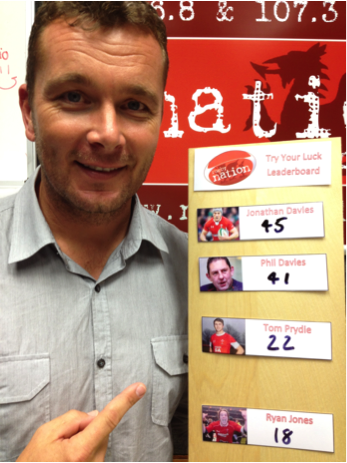 Jonathan, who is enjoying a fantastic start to the season with his home Region and who played an integral part in Wales’ Grand Slam success last season, met Sean and Jeff Collins to talk all things rugby but also to ‘Try His Luck’ in the weekly guest quiz. In a refreshing interview Jon discussed the Scarlets vs Ospreys derby match, his form for Wales and the possibility of selection in a Lions year. He also answers Tweets and emails from his fans.